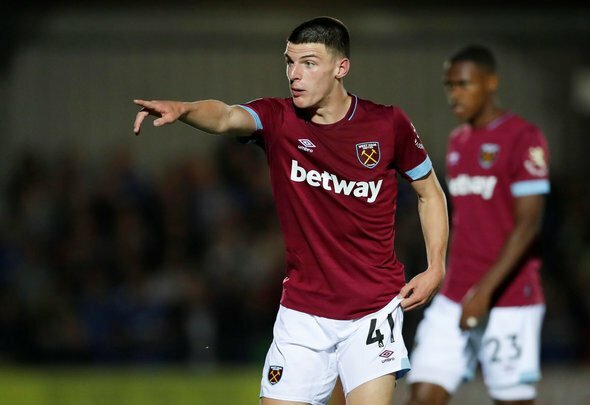 West Ham midfielder Declan Rice is unlikely to accept the club’s latest contract offer in what would be a significant blow, according to insider ExWHUemployee. Speaking on the West Ham Way show on Phoenix FM (39:16), Ex confirmed that the club’s latest offer amounts to a basic wage of £21,000-a-week, with that increasing to around £40,000-a-week including bonuses. Ex then claimed that he does not believe the 19-year-old would take the offer, with his wage still paling in comparison to other first team players. “I don’t believe Declan is going to accept that,” he said. Claret and Hugh, who first reported the details of the offer, claim this is the final offer from the club, who will not negotiate again until the end of the season if he does not accept. Rice, who stands at 6ft [Transfermarkt], has become a key player for the Hammers since his first-team debut in the 2016/17 season. Should Rice turn around and reject West Ham’s offer it would be a monumental blow for the club. According to what has been said by Ex and other insiders, this is supposedly the final offer from the club until the end of the season. So, while the club would essentially be benefitting in the short-term with Rice remaining on his current £3,000-a-week deal, that would cause huge problems between the two parties, and who knows what Rice would do in the summer. He would likely view that as a slight from the club, and may end up looking to move elsewhere. As also pointed out in the West Ham Way podcast, there is not likely to be a single team in the Premier League who would not want to sign the young talent, who has proved himself over a period of time at the top level. It is inexplicable that the club are not willing to stump up more cash for Rice, who is arguably their biggest talent in years, and fans must now hope that there are no further issues in this long-running saga.